Wilbert George (Gus) Prentice DDS passed away peacefully at High Crest Nursing Home, Springhill on January 21st, 2019 following a lengthy battle with Alzheimer’s disease. The son of the late Blanche and Ernest Prentice, he is survived by his wife Eleanor (Wry), married for 69 years, son John (Barbara), daughter Ruth Norton (Stuart), five grandchildren and eight great grandchildren as well as numerous nieces and nephews. He was also predeceased by stepfather Michael Rae, brothers John and Leonard as well as step sister Lorraine and half sister and half brother Doris and Aubrey. 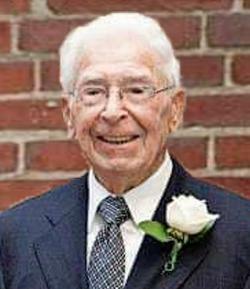 Born November 6, 1920, Gus was raised and spent most of his life in Springhill. His father died when he was an infant so his early years were spent helping to support his mother and family. Subsequently he left school at age 15 to work full time. With the onset of World War II, he enlisted and served overseas in France and Holland. Following the war, he returned to school, attending high school in Moncton, then Dalhousie University where he graduated from Dental School in 1955. He returned to Springhill as the only town dentist for several years, retiring at age 70. Having too much energy and enthusiasm for retirement, he began his next career as starter at Northumberland Links, a role that he proudly performed in his kilt, well into his 80’s. At that point, he began his final career, performing assessments on behalf of Veterans Affairs of veterans who were residents in nursing homes. This was a role that was very important to him as the visits and attention to elderly veterans often brought comfort to those he visited. He finished this final role in his 90’s. Gus was a man of strong values and beliefs with great determination in all aspects of his work and personal life. He was meticulous in his professional practice, always willing to help someone in need. He was actively involved in his community, leading fund raising efforts for the All Saints Hospital facility in Springhill. He was instrumental in starting the Springhill golf and curling clubs, actively involved in St. Andrew’s Wesley United Church as well as numerous civic organizations. He was an avid golfer, curler, a passionate gardener and enjoyed music of all varieties. Later in life he developed a keen interest in painting and needle work. Gus enjoyed spending family time both at home as well as at the family summer cottage at Northport where he particularly enjoyed hosting family dinners. He was a great role model for all that knew him and a strong supporter of his family both through successes and other times and particularly delighted in beating his grandsons at golf (on numerous occasions!). Sadly with the progression of his Alzheimer’s, his many memories of a life well lived, were gone. Despite this, he remained positive and grateful in his last few years for the assistance of those around him, particularly the staff of High Crest, Springhill – a special thanks to High Crest staff. Arrangements are under the direction of the A H Brown Funeral Home, 5 McFarlane Street, Springhill, (902 597 2361) where visitation will be held on Saturday, January 26, 2019 from 12:30 until 2 pm, followed immediately at 2 pm by a Celebration of Life with The Reverend Wayne McCarther officiating. In lieu of flowers, donations may be made to a charity of ones choice. Sharing of memories and condolences and sharing of memories may be sent to the family by visiting Gus' online memorial at www.brownsfuneralhome.com or through the A H Brown Funeral Home Facebook Page.